For those that want to do service their own scooters. Also ideal for non LML dealers wanting to service to a dealer standard. This kit includes all thats needed for the first 500km and FULL services. 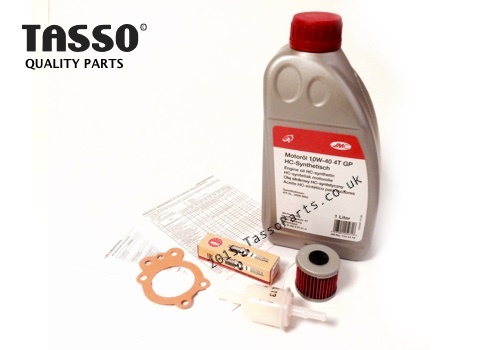 In the kit is engine oil 10W40, Oil filter, Gasket, spark plug and fuel filter. We also include the service chart to check off all thats required on each service. Buying the kit will save 10% than buying items separately. Oil brands vary but will always be of similar high quality synthetic. All items in this kit are available separately.